Module style overrides allow you to add your own little flair to the module position of your choice. With each override created you can set your own unique styling to the module position of your choice. Styling options include background and text color, background image and padding settings giving you complete control of your module position styling. As many overrides as you wish can be created and if no override exists for a position then the default template styling is used. With Chelsea we have added a host of new possibilities for the main header navigation. Easily split your menu dropdowns in to multiple columns means you no longer have to worry about lengthy dropdown displaying outside of the viewport. Add some extra information to your main menu items with the addition of menu item sub titles. And finally we have added a megamenu option allowing you to easily add modules directly in the dropdown menu. As with all Joomla51 templates we have ensured total control how how the template looks and feels with a host of color, typography and layout options. All options area easily accessible with an easy to use template parameters area making Chelsea the ideal Joomla template to awaken your creative side. 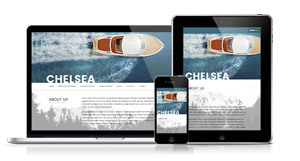 Be creative today with the Chelsea Joomla template!